I'm going to go Friday. If it's not windy... At least I'll check it. Going up to Tupper lake on the first. My first time going. Appreciate it, I'm about an hour 15 from the area so I cant actively check or I would. Good luck on tupper, I fished west caroga the other week and grafton state park last week and both places really destroyed me, barely caught anything. Good evening or should I say early morning, Loudmouth879 thank you for all the work you do with the NY. badges each year may you and your friend have a great time fishing. Catskills welcome to Ice Shanty and the Southern NY. thread in the NY.Reports & Conditions forum there is a thread for Big Pond in Delaware county last report on ice conditions is from last Friday (1/4) states only 2 and a half inches at that time. Given the remoteness of the place I suggest taking a buddy in case anything happens cell phone reception might not be great.Over the years that I've been on Ice Shanty most reports state fishing can be hot or cold once in a while someone would post a photo of a 18 inch or larger trout but not common . Need Ice,Hard water Diehard my thanks to both of you for taking scouting trips in Sullivan county. Folks I suggest giving bait shops a call before heading out this weekend think there will be a rush of people heading out to fish with this colder weather. Be safe and good fishing to all of you. nice smitty. Have the skis now have to do the rest. did you come up through the skis with lags? Good morning Beachwoods 16 in the ice fishing videos forum you will find a topic labeld Smitty Sled by Len F. ,Len show most of the step in building the sled and materials/hardware he used for the project .Might be of help to you. Catskills you welcome happy to be of some help. May I ask a small favor of you please update your profile so your avatar will show your general location. 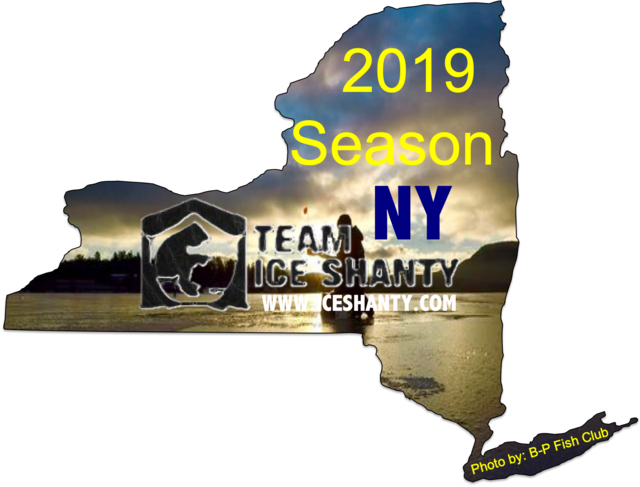 (county and state for example) this helps other Ice Shanty members when they reply to your posts especially if you are posting in other forums and not those related to NY. Where members may naturally assume you live NY. My thanks in advance for your doing this favor. My local, southern Sullivan lake is not yet safe! The wind kept it open until late yesterday, this AM there was about an inch in by shore, yesterday all water from my shore all the way across. Extremely slight chance of going out Sunday, hoping for the best. I do wonder if some of the smaller Sullivan ponds may have locked up regardless of the windy conditions all week. Next week is the middle of the month! Yeah BlueSail.. I just did a lil run around in the area..although a lot is locked up..wishful thinking for Sunday...maybe that "pond" will be prime ..Surprised that your main lake was pretty much locked up ..that southern end was locked up yesterday and even further out today . I'd be surprised if the smaller Sullivan ponds weren't locked up considering someone said they were on Superior 3 days ago? Anybody know about big pond? Thinking a little further north will be better. i was going to book an airbnb with the wife and kids for a weekend on yankee this month. the weather was so bad though we are pushing back to Feb. any tips for yankee? Yankee is a good ice fishing lake. Bass, Pickerel, Perch, nice big cat fish and probably Crappie. If the temps we have right now continue it should be fine in Feb.
Big minnows in the shallows for pickerel ...move out if no bites...make some pickled pickerel you wont be disappointed .Are you familiar with the bait shops in the area ? i think im good with bait, we've been up in that area a few times and stopped by toms and sportnuts. im all ears though if there are better options. stayed on a pond in forestburg one summer which had great crappie/perch/pickerel action and yankee early last spring but it was too warm for ice and too cold to bring the yaks with kids (my boys are only 3 and 6). im really just looking for some panfish action to keep them interested. will setup tipups for something large but everything is going back. the long weekend airbnb trips we do on water are really just 25+ year reconnaissance missions for our future retirement home. we stayed at a place on bomoseen this past summer, so far that lake is #1 on my list, but these private ponds in ny are also in my top 5. ideally i cant wait to GTFO out of NJ and buy something small in upstate NY or farther N near lake george/vermont. Which small pond in Forestburgh? That's where I am. I don't know much about Airbnb but if you can search for places I would try Lake Devanage or Highland Lake in this general area. Both are private but both have some good fishing and I think Devanage has some nice trout. I grew up and cut my ice teeth on Masten Lake and we owned and operated the old public swimming beach called the ML Casino. Not there any more but it sure was a special place to grow up. YUP! Right up the road from my house in Hartwood at the blinker. Some decent LM Bass in there but all on the small side. Let me know if you find places on the lakes I mentioned. Airbnb seems to be coming on pretty strong in this area lately and I take care of a neighbors place listed on the site. Hello everyone. I don't need to post this because others have already.. I checked five places and all had open water at places. But I think. Surperior on 17b side might be ok by Sunday. But long walk not for a person with lots of great. How bad was the Superior boat launch? when you say superior by 17B side are your referring to the trail you have to walk thru the woods to access the lake or chestnut lake thru the swamp? I always came from Puckyhuddle. Is there a way through the swamp? I don't know. Yesterday was my first day going throw the trail.